The war between the UK and Argentina over the Falkland Islands ended almost 28 years ago. But tensions over the sovereignty of the islands have never quite gone away. Argentina still claims sovereignty over what it calls the Islas Malvinas. The discovery of oil and gas in the area has added an economic dimension to the long-running dispute between the two nations over the islands. This week, Argentina has imposed new controls on shipping to the Falkland Islands in a growing oil dispute with the UK. Argentine President Cristina Fernandez on Tuesday signed a decree that requires all vessels travelling between Argentina and the islands or those that want to cross Argentine territorial waters en route to the Falklands to seek prior permission. This also applies to vessels going to the other nearby British controlled islands in the South Atlantic - South Georgia and the South Sandwich Islands. It could make drilling in the area more complicated and expensive for foreign firms. 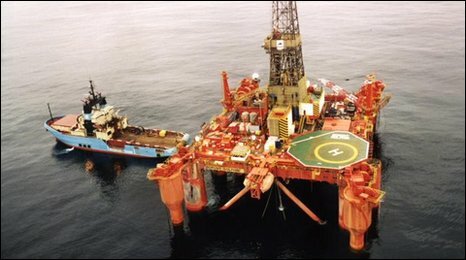 A drilling rig from the Scottish highlands, the Ocean Guardian, is expected to arrive soon to begin oil exploration . A government minister explicitly said the move was to protect control of "resources" in the area. In April, Argentina formally laid claim to 1,700,000 sq km (650,000 sq miles) of ocean surrounding the Falklands - handing over 800kg of documents to the UN. The country passed a law in December claiming to own the islands and several other British overseas territories. When did they discover oil? In 1998, six wells were drilled to the north of the Falkland Islands - an area about half the size of Texas. With crude oil dropping as low as $10.35 a barrel that year, it was decided it was not commercially viable to drill the wells. Now, with oil above $75 a barrel, there is a lot more interest to find out just how much oil is there. A number of oil companies have exploration rights now. British oil firm Desire Petroleum hold the exploration rights to that area now. The territory - which has fewer than 3,000 people - also started gold and minerals exploration in 2004. Fishing accounts for the largest part of the economy, followed by farming and tourism. So how much oil and gas is there? The often-used figure based on geological surveys is that the Falkland Islands have the equivalent of about 60 billion barrels of oil in total. But Ben Brewerton, spokesman for the UK-listed Falkland Oil and Gas, told the BBC this figure is "slightly mythical" and no-one knows where it came from. By contrast, Saudi Arabia - the world's biggest oil producer - has proven reserves of more than 267 billion barrels of oil and produces more than 10 million barrels of oil a day. Falkland Oil and Gas - which has the exploration rights for the south and east of the islands - said it estimates its four biggest prospects in the area have 8 billion barrels of oil. Development of the island's energy resources are still in the exploration stage. Drilling will take place later this year. If oil and gas is discovered in commercial quantities, then it will be no sooner than five years before oil is being extracted from the ground, Mr Brewerton said. The recent political uncertainty has not deterred the companies there. "There's been no disruption to our work thus far," Mr Brewerton said. Neither has the uncertainty over how much oil may be there. Anglo-Australian firm BHP Billiton has partnered with Falkland Oil and Gas. The fact that one of the world's biggest miners is there is a sign that experts are convinced the Falkland Islands have a future as an oil producer.